This summer, Climate Solutions commissioned new research identifying pathways to phase out fossil fuels from our power sector in the Pacific Northwest. Energy and Environmental Economics (E3) conducted the analysis by modeling several scenarios to identify the most cost-effective transition strategies. 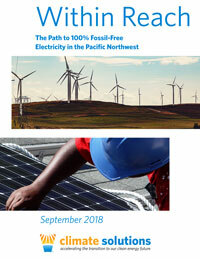 The resulting report, Within Reach: The Path to 100% Fossil-Free Electricity in the Pacific Northwest, takes a deeper look at how Washington can make an affordable, timely, and reliable transition by phasing out coal and gas and investing in renewable energy, energy storage, and energy efficiency. This article summarizes the report's key findings. Powering our region on 100% clean energy is not only possible, but practical. In fact, as recent research bears out, phasing out fossil fuels and phasing in more renewables will give us a reliable and affordable electricity system. The lights will stay on—and our bills will stay affordable. In 2017, Washington state released a study (Deep Decarbonization Pathways) presenting strategies for Washington to achieve 80% reductions by 2050, while saving money on energy costs and providing cleaner air and water for all of our residents to breathe and drink. The study included two high-level conclusions: in order to achieve our climate goals we must (1) largely stop using fossil fuels to produce electricity, and (2) shift as many things as possible that use fossil fuel power, to run on clean electricity instead. Climate Solutions recently worked to jump-start progress towards the first of those goals. During Washington’s last legislative session, we joined with several key partners including Audubon Washington and the International Brotherhood of Electrical Workers to support legislation that would clean up our electricity grid. The bill we supported would have eliminated the use of coal by Washington power utilities and placed us on a on a pathway to 100% fossil-free electricity by 2045. Despite the fact that a vast majority of utility customers support a transition to 100% clean energy, utilities stood against our proposed policy—claiming that a 100% clean electricity sector wasn’t possible. The utilities’ opposition helped stop the Legislature from holding a final floor vote despite key committees advancing the policy with bipartisan support. Building on our state’s foundation of existing hydropower, we can end our reliance on fossil fuels in the power sector through more wind, solar, energy storage and energy efficiency. Adding renewable biogas to that mix will provide a least-cost pathway to achieving 100% fossil-free electricity. Fossil fuels are not needed for affordable energy—we can afford the transition to clean power. The scenarios E3 examined differ in the mix of energy sources the model can select from and the cost assumptions for clean energy, and show how different strategies produce different amounts of efficiency, waste and cost. Because the scenarios are based on current projections of energy costs and efficiency, they don’t necessarily capture the cost declines we might see for clean energy, nor do they incorporate new energy-saving technologies that we know are on the horizon. For example, solar power costs have dropped more than 70% in the past eight years, and battery storage costs are projected to plummet further with growth in the market. So while the model includes some cost-reduction projections and does acquire more energy efficiency, most past predictions have underestimated how fast and how far prices will decline and how much energy efficiency ends up being acquired. This strongly suggests that the findings here should be considered worst-case scenarios, and that achieving these reductions will in fact be easier and cheaper than these scenarios predict. 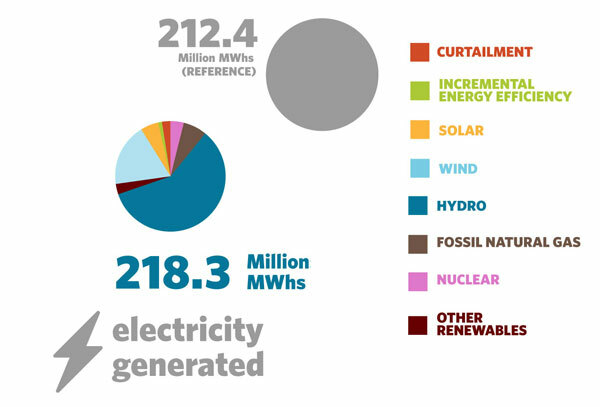 The first scenario assumes a path to 100% clean electricity with hydro, wind, solar, and geothermal as the only new resource options for fossil-free generation. This scenario relies on old cost assumptions for clean energy and high battery costs, and completely restricts new dispatchable power (resources which could be switched on and off to meet demand). 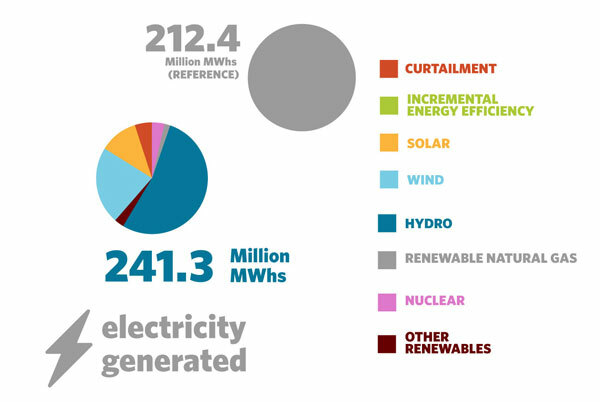 As shown in the figure below, this model results in grossly overbuilding our energy resources to meet peak demand. Most of the energy ends up being wasted, or "curtailed," and the costs are high--around $18 billion, or more than $0.08/kwh levelized across all the utilities in Washington and Oregon. This is far from the future we envision; happily, there are better options. The second scenario makes one change from scenario A: it adds sustainably-sourced biogas as an available resource, alongside hydro, wind, geothermal and solar. Renewable natural gas (not fracked) comes from sources like sewage treatment facilities, local landfills and dairy waste. Renewable gas functions identically to its fossil gas counterpart and helps to fill in any energy gaps left by renewable energy. With the ability to store the fuel, electric generation can be turned on and off, reducing the need to overbuild our system to meet peak demand as in the first scenario. 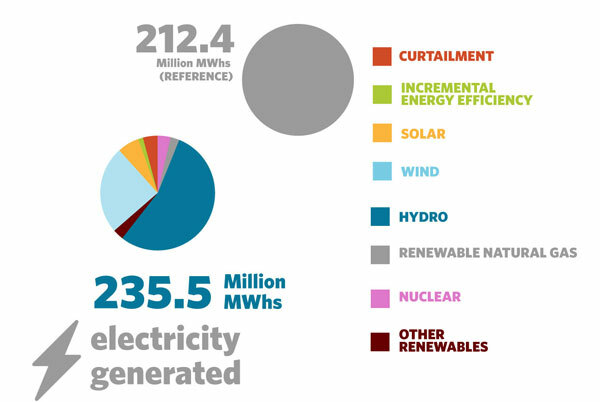 This single addition vastly reduces the cost of eliminating fossil fuels from our electricity mix, largely due to less wasted energy (see the figures below). This study’s findings, coupled with analysis from the US Department of Energy, shows we have more than enough renewable biogas potential for what we need in the future. One thing is clear, cost assumptions matter. This scenario measures the effect of adding biogas using old cost estimates (Figure B1) as well as updated cost assumptions (Figure B2) which better reflect what we are seeing in today’s renewable energy market. With just this cost update, the model no longer requires regional utilities to build new thermal resources (the kind that mostly rely on fossil fuels), and instead relies on new investments in energy storage, wind and solar to provide energy and balance the grid. The costs of achieving a fossil-free grid drop even further and results in just a $0.01/kwh impact, spread across all utilities in Washington and Oregon. Simply by adding renewable natural gas, achieving 100% clean energy becomes much cheaper and results in much less wasted energy. The final scenario most closely mirrors the 100% fossil-free legislation from the 2018 legislative session. It puts utilities on the pathway to eliminating fossil fuels from the grid by 2050, and provides cost protections in case technologies do not advance as rapidly as the industry projects. This scenario--even with outdated clean energy cost assumptions--results in over 85% carbon reductions in the electricity sector at a cost of just about $0.005/kwh (not a typo, that’s half a penny). Adding flexibility to this scenario preserves a path for achieving a full 100% reduction of carbon emissions by 2045, assuming we see cost reductions and technological advances over the next few decades as we have seen in the past. Our new research makes it clear: a completely fossil-free electrical grid will provide clean, reliable, affordable power. What would be risky, in fact, would be waiting any longer to speed up our transition to 100% clean energy. 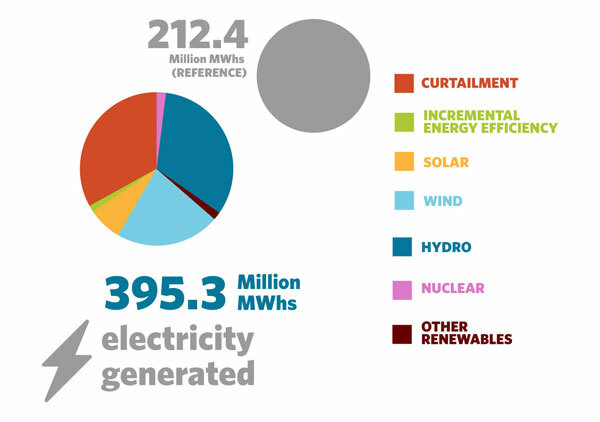 Washington utilities are currently planning to build nearly 2500 megawatts of new fossil fuel generating capacity. If they build these now, knowing that we need to end our reliance on dirty energy, customers like you and me will still be stuck paying for those facilities when they retire early—just as we are now seeing with coal plants. And while we pay for decisions we had no control over, you can bet that shareholders and utilities will do their utmost to hold themselves harmless. Going fossil-free will help protect against these mistakes. With clean energy, we will avoid risky investments in fossil fuels that will cause us to blow past our carbon goals, while also growing regional economic opportunities. Research has shown that clean energy creates more jobs per unit than fossil fuels do. Investment in battery technology and pumped hydro storage will create thousands of family-wage jobs that cannot be outsourced. A clean energy transition truly offers the opportunity to support widely shared prosperity while combating climate change. 100% fossil-free by 2045. Let’s keep fighting together until it is the law.